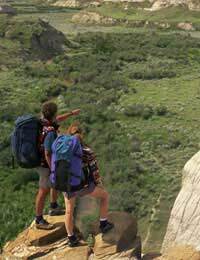 Back Packing and Gap Years enjoy almost iconic status as rites of passage from school years and the rest of your life. Travelling the world – or at least some of the exotic parts of it – have become synonymous with the whole experience but what do you do if you want the adventure, but you have a green conscience too? How do you reconcile the two? In many ways, the ethos of eco-friendly back packing is the same as any other environmentally responsible trip – and as such, all of the usual advice applies about planning, packing, health and minimising the harm, maximising the benefits of your visit. Where the Gap Year differs from most, however, is in the duration and it is here that the most damage, or the greatest good, can be done. It is all about balance. One obvious way to minimise the environmental impact of your travels is to consider staying nearer to home – perhaps not for the whole time, but possibly for some of it. While there is sometimes a bit of a feeling that journeying around Britain is not really playing the game, places such as the coastline of Cornwall, Snowdonia or the Highlands of Scotland – Europe’s last wilderness – to mention but three, are worth anyone’s time to get to know. A short ferry ride – one of the most efficient methods of mass travel – brings the Orkney Islands, the Western Isles and Ireland herself within reach, each with their own unique charm and opportunities to offer. Fitting a more “local” stage in your gap year is definitely nothing to be ashamed of – however long or short it ends up being. Travelling always comes at a cost – environmental as well as monetary. Wherever the destination, trying to use the most eco-friendly means of getting there is always a good plan. Depending on where your wanderings take you, many places can be successfully reached by train or coach. Air travel is not always the only option, especially since half the point of the back packing approach is to experience the places you visit and you can hardly argue that you are pushed for time on a gap year! Following on in the same vein, bicycle hire is often available as a cheaper – and decidedly more environmentally friendly – alternative to hiring a car and folding bikes make it so easy to link in with local public transport to go further afield. Of course, for the full-on back-packing eco-warrior, the ultimate environmentally friendly Gap Year experience has got to be working on a suitable project. This typically entails hard work and may involve you paying for the privilege, though it does give you a unique perspective on the practical reality of the whole environmental issue – and can be a great way to meet like minded people. In the UK, the RSPB and British Trust for Conservation Volunteers are good points of first contact and many of the wildlife organisations have projects overseas. The Whale and Dolphin Conservation Society for example have projects from the Azores to Argentina, while the Wildlife Trusts Partnership run basking shark expeditions aboard their 40ft sailing yacht. It has been said that one of the reasons that eco-tourism is growing three times faster than mainstream is that it is less about doing the right thing and salving your conscience, but more about re-forging a connection to nature and people. If that means rather than gazing on the standard bedroom of a could-be-anywhere hotel group when you wake, knowing where you are from the moment you open your eyes – then backpacking surely fits the bill. The Gap Year has traditionally always been done on something of a budget – with a bit of thought and careful planning, the expression “it needn’t cost the earth” can ring literally true, too.